Our Human Demolition game is a multi-player game where the four participants swing the large wrecking ball at each other trying to knock their opponents from their podiums. The last person standing is the winner! 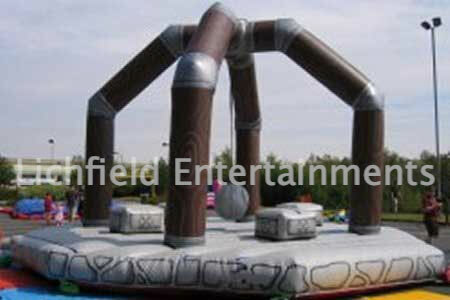 The Human Demolition Inflatable is great for fundays, team building, and parties. A trained member of our staff is provided to supervise the use of the Human Demolition Inflatable which is suitable for use by ages 8 - adult. It needs an overall operating space of at least 32x32ft. 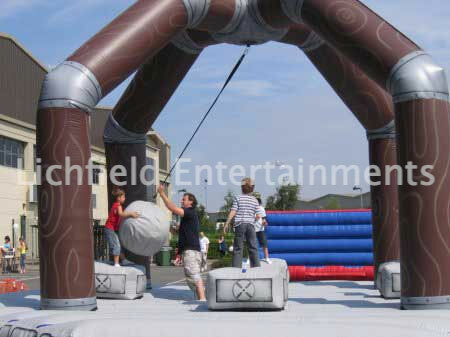 The Human Demolition inflatable can be used indoors but due to its size you'll need a sports hall or similar as it needs a 23ft height clearance. If you have any queries, questions or would like to book the Wrecking Ball Inflatable, please click here to enquire and we will do all we can to help.